Over the weekend a couple of our friends stopped by to meet Otis. They came bearing gifts. Flowers for mommy and a Rick Bayless cookbook for daddy, an autographed one nonetheless! The in-laws haven’t really experienced Mexican flavors since there really aren’t many Mexican ingredients available in Japan. 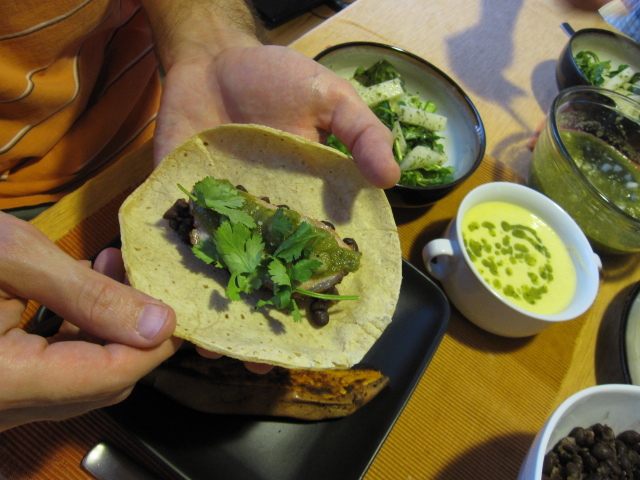 While there are a few “Mexican Restaurants”, they’re really just simple mid-scale taquerias. Combine the cookbook, their lack of Mexican food experience, and the fact that Chicago hit 90 degrees yesterday and I really had no choice but to grill up some tasty tacos with all of the fixens. 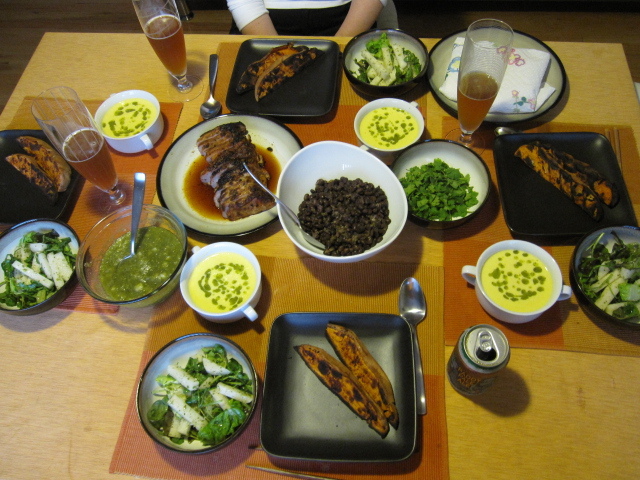 Some of the dinner was right out of the Bayless cookbook (cilantro-lime dressing, jicama salad, and roasted tomatillo salsa), some was inspired by the Bayless cookbook (grilled pork and sweet potatoes where he used ancho instead of chipotle), and some is right out of my repertoire (chilled corn soup and simmered black beans). First thing I made was the cilantro-lime dressing. 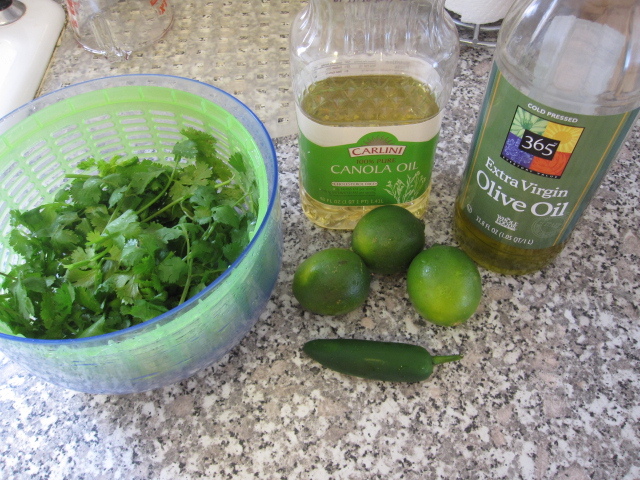 I used 1/2 cup of cilantro, the zest from 1 lime and the juice from three, 1/2 jalapeno seeded and stemmed, 1/2 cup canola oil, and 1/4 cup olive oil. I threw it all into my little blender and whipped it up! I seasoned it with a little salt and pepper, poured it into a glass jar, and let it sit in the fridge while I prepared the rest of the dinner. Next, I made the corn soup. 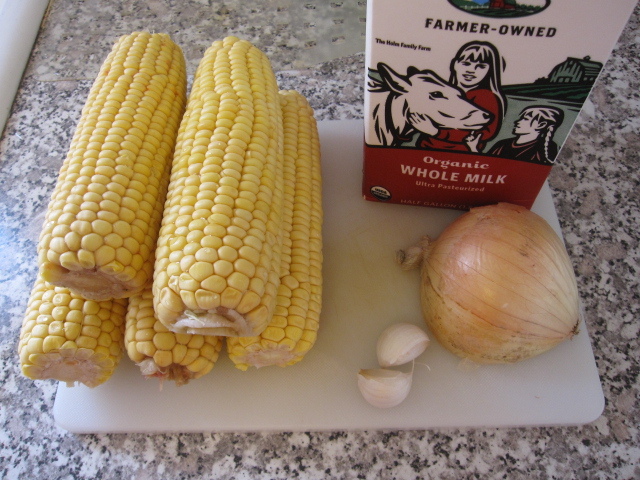 I cut the kernels off of 5 ears of corn, chopped up 2 garlic cloves, and diced 1/2 onion. I put it all into a pan with 1/2 cup of milk and 1/2 cup of water and brought it up to a low boil. I covered the pot and let it simmer over med-low heat for about 20 minutes. 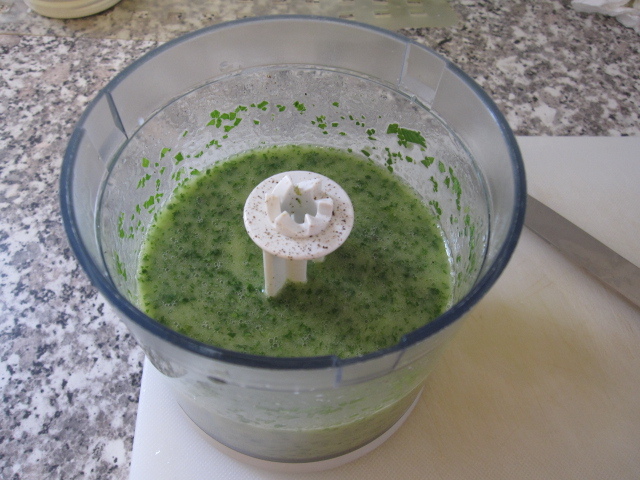 Then I let it cool down and poured it into my blender for a good puree. I seasoned it with salt and pepper and let it sit. Since I was serving it cool I didn’t need to reheat it or anything. I did pour it back into the pot so I could clean the blender for the next item. 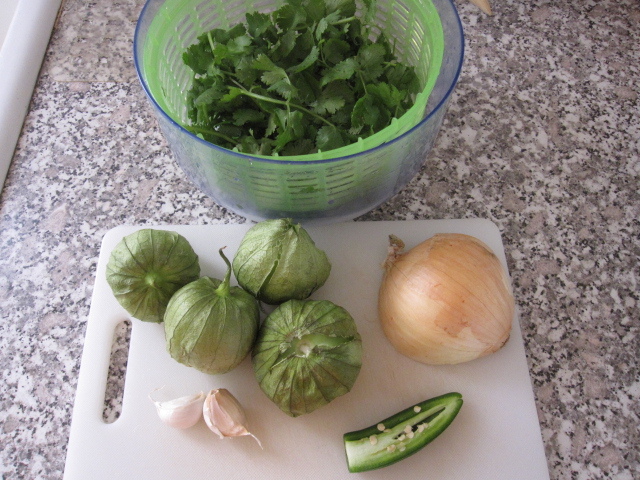 For the roasted tomatillo salsa I husked, rinsed, and halved 4 tomatillos, pealed 2 garlic cloves, chopped the other half of the jalapeno, small diced 1/2 a small onion, and roughly chopped 1/3 cup of cilantro. I soaked the diced onion in cold water for 30 minutes to remove some of the sharpness. 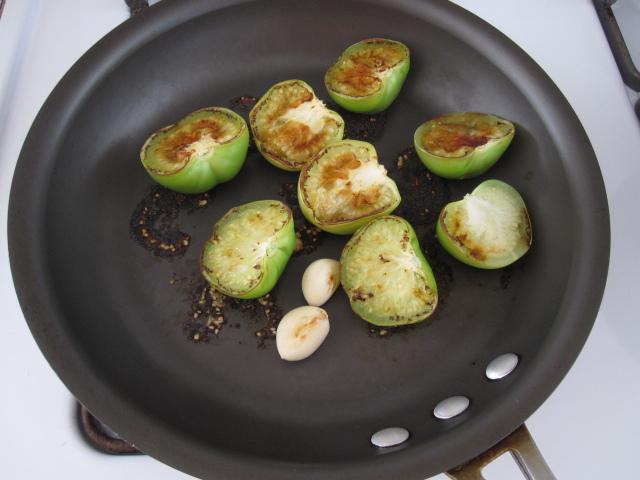 In a hot, dry skillet I put the tomatillos (cut side down) and garlic in to roast, about 5-6 minutes per side. Then I put everything except for the onions into the blender along with 1/4 cup of cold water and pureed it up. I poured it into a glass bowl and mixed in the rinsed onion. That went into the fridge until dinner time. 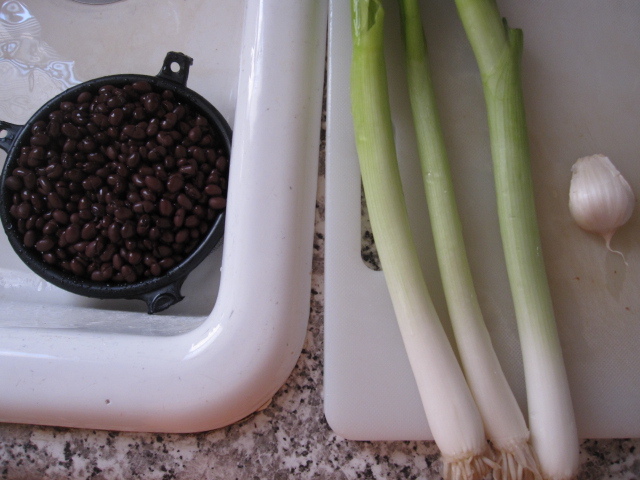 I opened up a 30 ounce can of black beans, rinsed them off, and placed them in a pot with 3 diced green onions, 1 minced garlic clove, and about 1/4 cup of water. I let it simmer for about 20 minutes and then seasoned with salt and pepper. 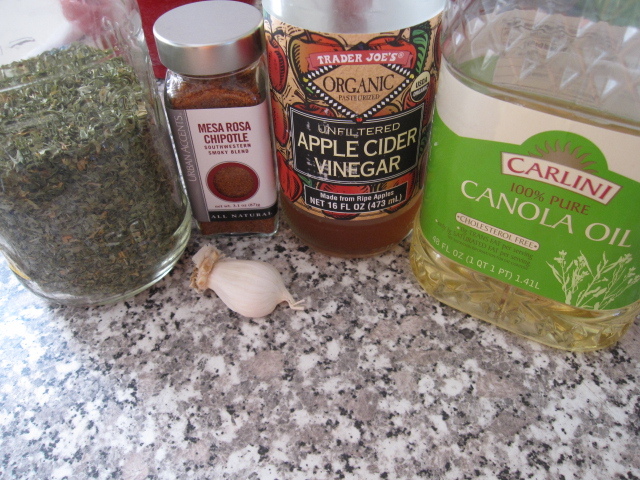 For the spice rub I used 1 teaspoon of dried oregano, 1/4 cup of chipotle (the chipotle I have has a little sugar mixed into the blend, otherwise I would have added a little), 2 tablespoons of apple cider vinegar, 2 tablespoons of canola oil, and 2 garlic cloves finely minced. I mixed it all together until it became a smooth paste. 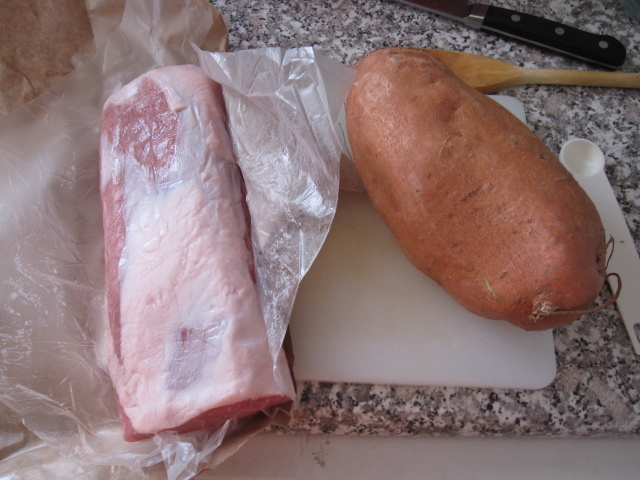 I rubbed the chipotle paste all over a 1.5 pound pork loin and a large sweet potato that I had cut into 8 wedges. I heated up the left side of my grill to med-high and the right side to med-low. 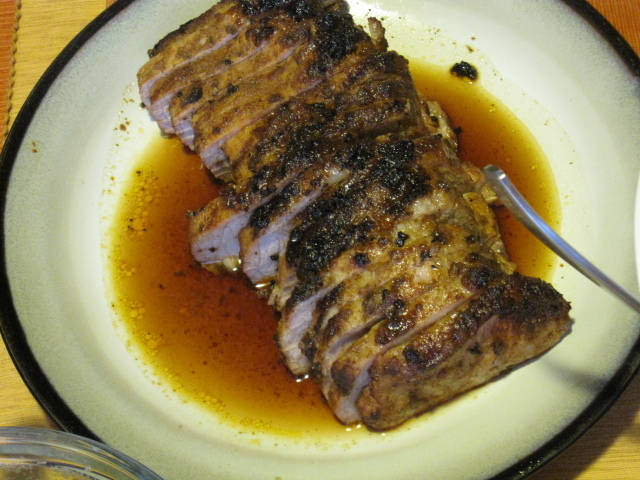 I first put the pork loin over direct heat, fat-side down, for about 5 minutes to give it a nice crust. Then I moved it to the top rack, turned it over, and turned the heat down to med-low. At the same time I put the sweet potato wedges on the top rack over the right side. I closed the grill and let it go for about 15 minutes. 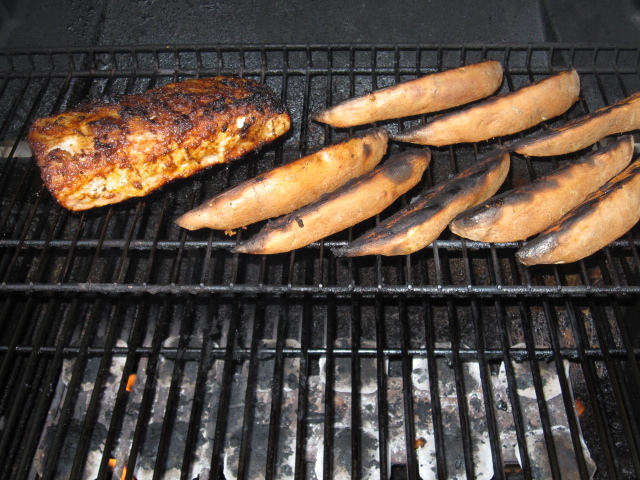 Then I turned over the sweet potato wedges, covered the grill again, and let it go for another 10 minutes. When I took the meat off the grill I tented it with foil and let it rest for 10 minutes before slicing it up. Look at that piece of swine! Doesn’t that just make your mouth water? I have to say, it might be the juiciest, most flavorful piece of pork I have ever grilled. While the grill was going I put together a jicama salad. I peeled a medium jicama and then cut it into 1/4 inch width sticks. 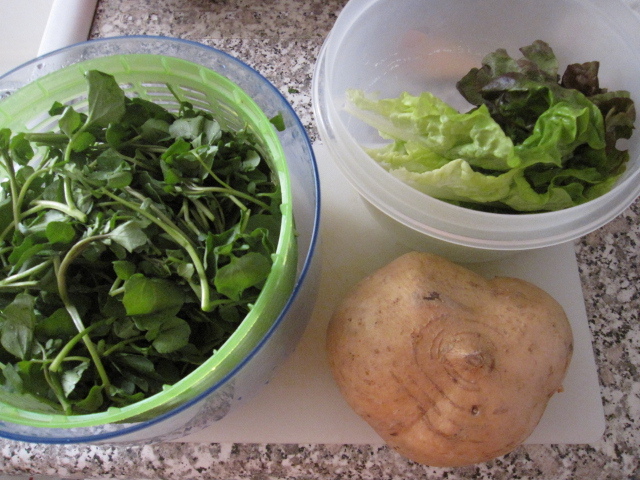 I tossed it in a large bowl with some watercress, chopped red leaf lettuce, and some of the cilantro-lime dressing. When everything was ready I heated up some corn tortillas and laid everything out on the table. The corn soup got a drizzle of cilantro-lime dressing for garnish. We made tacos and drank beer and filled our bellies! Yuki’s parents were quite impressed with dinner. Honestly, so was I. Everything turned out fantastically! Thank you Mr. Bayless! And thank you Mr. Eirinberg! Gracias por la deliciosa cena, Papa!! Wow. Time for your own show, Dan. Now next time video tape the steps…I’ll help you edit- and send it off as a demo or just post here…and you tube and watch the magic happen. SImply way to talented not to swing down into the future you light saber!